The whole human race perished in the person of Adam. Consequently that original excellence and nobility which we have recounted would be of no profit to us but would rather redound to our greater shame, until God, who does not recognize as his handiwork men defiled and corrupted by sin, appeared as Redeemer in the person of his only-begotten Son. Therefore, since we have fallen from life into death, the whole knowledge of God the Creator that we have discussed would be useless unless faith also followed, setting forth for us God our Father in Christ. The natural order was that the frame of the universe should be the school in which we were to learn piety, and from it pass over to eternal life and perfect felicity. But after man's rebellion, our eyes - wherever they turn - encounter God's curse. This curse, while it seizes and envelops innocent creatures through our fault, must overwhelm our souls with despair. For even if God wills to manifest his fatherly favor to us in many ways, yet we cannot by contemplating the universe infer that he is Father. Rather, conscience presses us within and shows in our sin just cause for his disowning us and not regarding or recognizing us as his sons. Dullness and ingratitude follow, for our minds, as they have been blinded, do not perceive what is true. And as all our senses have become perverted, we wickedly defraud God of his glory. We must, for this reason, come to Paul's statement: "Since in the wisdom of God the world did not know God through wisdom, it pleased God through the folly of preaching to save those who believe" [1 Corinthians 1:21]. This magnificent theater of heaven and earth, crammed with innumerable miracles, Paul calls the "wisdom of God." Contemplating it, we ought in wisdom to have known God. But because we have profited so little by it, he calls us to the faith of Christ, which, because it appears foolish, the unbelievers despise. Therefore, although the preaching of the cross does not agree with our human inclination, if we desire to return to God our Author and Maker, from whom we have been estranged, in order that he may again begin to be our Father, we ought nevertheless to embrace it humbly. Surely, after the fall of the first man no knowledge of God apart from the Mediator has had power unto salvation [cf. Romans 1:16; 1 Corinthians 1:24]. For Christ not only speaks of his own age, but comprehends all ages when he says: "This is eternal life, to know the Father to be the one true God, and Jesus Christ whom he has sent" [John 17:3 p.]. Thus, all the more vile is the stupidity of those persons who open heaven to all the impious and unbelieving without the grace of him whom Scripture commonly teaches to be the only door whereby we enter into salvation [John 10:9]. But if anyone would like to restrict this statement of Christ to the publishing of the gospel, there is a ready refutation: it was the common understanding of all ages and all nations that men who have become estranged from God [cf. Ephesians 4:18] and have been declared accursed [cf. Galatians 3:10] and children of wrath [cf. Ephesians 2:3] without reconciliation cannot please God. Besides this, Christ answered the Samaritan woman: "You worship what you do not know; we worship what we know; for salvation is from the Jews" [John 4:22]. In these words he both condemns all pagan religions as false and gives the reason that under the law the Redeemer was promised to the chosen people alone. 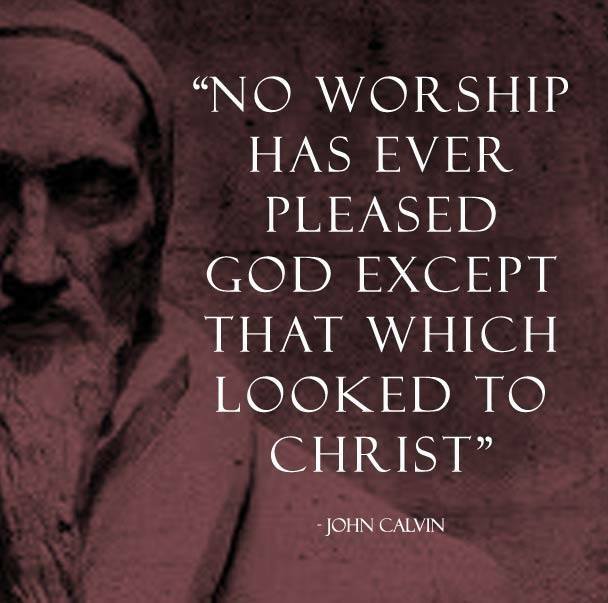 From this it follows that no worship has ever pleased God except that which looked to Christ. On this basis, also, Paul declares that all heathen were "without God and bereft of hope of life" [Ephesians 2:12 p.]. Now since John teaches that life was in Christ from the beginning [John 1:4], and all the world fell away from it [cf. John 1:10], it is necessary to return to that source. So also, Christ, inasmuch as he is the propitiator, declares himself to be "life" [John 11:25; 14:6]. To be sure, the inheritance of heaven belongs only to the children of God [cf. Matthew 5:9-10]. Moreover, it is quite unfitting that those not engrafted into the body of the only-begotten Son are considered to have the place and rank of children. And John clearly declares: "Those who believe in his name become children of God" [John 1:12 p.]. But because it is not yet my purpose exhaustively to discuss faith in Christ, it will be sufficient to touch upon it in passing. Accordingly, apart from the Mediator, God never showed favor toward the ancient people, nor ever gave hope of grace to them. I pass over the sacrifices of the law, which plainly and openly taught believers to seek salvation nowhere else than in the atonement that Christ alone carries out. I am only saying that the blessed and happy state of the church always had its foundation in the person of Christ. For even if God included all of Abraham's offspring in his covenant [cf. Genesis 17:4], Paul nevertheless wisely reasons that Christ was properly that seed in whom all the nations were to be blessed [Galatians 3:14], since we know that not all who sprang from Abraham according to the flesh were reckoned among his offspring [Galatians 3:16]. For, to say nothing of Ishmael and others, how did it come about that of the two sons of Isaac, the twin brothers Esau and Jacob, while they were yet in their mother's womb, one was chosen, the other rejected [Romans 9:11]? Indeed, how did it happen that the firstborn was set aside while the younger alone kept his status? How, also, did it come about that the majority was disinherited? It is therefore clear that Abraham's seed is to be accounted chiefly in one Head, and that the promised salvation was not realized until Christ appeared, whose task is to gather up what has been scattered. So, then, the original adoption of the chosen people depended upon the Mediator's grace. Even if in Moses' writings this was not yet expressed in clear words, still it sufficiently appears that it was commonly known to all the godly. For before a king had been established over the people, Hannah, the mother of Samuel, describing the happiness of the godly, already says in her song: "God will give strength to his king and exalt the horn of his Messiah" [1 Samuel 2:10]. By these words she means that God will bless his church. To this corresponds the prophecy that is added a little later: "The priest whom I shall raise up... will walk in the presence of my Christ" [1 Samuel 2:35, cf. Vg.]. And there is no doubt that our Heavenly Father willed that we perceive in David and his descendants the living image of Christ. Accordingly David, wishing to urge the pious to fear God, commands them to "kiss the Son" [Psalm 2:12, cf. RV and marg.]. To this corresponds the saying of the Gospel: "He who does not honor the Son does not honor the Father" [John 5:23]. Therefore, although the Kingdom collapsed because of the revolt of the ten tribes, yet the covenant that God made with David and his successors had to stand, just as he spoke through the prophets: "I will not tear away all the Kingdom... for the sake of David my servant and for the sake of Jerusalem which I have chosen... but to your son one tribe will remain" [1 Kings 11:13,32]. This same promise is repeated a second and a third time. It is expressly stated: "I will... afflict David's descendants, but not eternally" [1 Kings 11:39]. Some time later it is said: "For the sake of David his servant, God gave him a lamp in Jerusalem, to raise himself up a son and to protect Jerusalem" [1 Kings 15:4, cf. Vg.]. Then, although affairs verged on ruin, it was again said: "The Lord was unwilling to destroy Judah, for the sake of David his servant, since he promised to give a lamp to him and to his sons forever" [2 Kings 8:19]. To sum up: while all others were passed over, David alone was chosen, as he in whom God's good pleasure should rest, just as it is said elsewhere: "He rejected the tent of Shiloh, and the tent of Joseph; and he did not choose the tribe of Ephraim" [Psalm 78:60,67, conflared], "but he chose the tribe of Judah, Mr. Zion, which he loved" [Psalm 78:68]. "He chose David his servant,... to shepherd Jacob his people, Israel his inheritance" [Psalm 78:70-71]. To conclude: God thus willed to preserve his church that its soundness and safety might depend upon that Head. Therefore David proclaims: "Jehovah is the strength of his people, the saving power of his Christ [Psalm 28:8, cf. RV marg.]. Immediately he adds the petition: "Save thy people, and bless thine inheritance" [Psalm 28:9], meaning that the condition of the church is joined by an indissoluble bond to Christ's authority. Another passage expresses the same idea: "Save us, O Jehovah; let the King hear us in the day that we shall call upon him" [Psalm 29:9]. By these words he clearly teaches that believers have sought refuge in God's help with no other assurance than that they were sheltered under the King's protection. This is implied in another psalm: "Save... O Jehovah!... Blessed be he who comes in the name of Jehovah" [Psalm 118:25-26]. There, it is sufficiently clear, believers are being called back to Christ, that they may hope to be saved by God's hand. Another petition expresses the same idea, where the whole church implores God's mercy: "Let thy hand be upon the man of thy right hand, upon the son of man whom thou hast preserved (or fashioned) for thyself" [Psalm 80:17, Comm.]. For although the author of the psalm bewails the scattering of the whole people, yet he begs for their restoration in the Head alone. But when, after the people have been carried off into exile, the land laid waste, and everything seemingly destroyed, Jeremiah sorrows for the calamity of the church, he especially bewails the fact that in the ruin of the Kingdom hope has been cut off from believers. "The anointed," he says, "the breath of our mouths, has been taken captive in our sins, he to whom we said, 'Under tiny shadow we shall live among the heathen.'" [Lamentations 4:20, cf. Vg.] From this it is now clear enough that, since God cannot without the Mediator be propitious toward the human race, under the law Christ always set before the holy fathers as the end to which they should direct their faith. Now, where solace is promised in affliction, especially where the deliverance of the church is described, the banner of trust. and hope in Christ himself is prefigured. "God went forth for the salvation of his people with his Messiah," says Habakkuk. [Habakkuk 3:13 p.] And as often as the prophets mention the restoration of the church, they recall the people to the promise made to David that his kingdom would be everlasting [cf. 2 Kings 8:19]. And no wonder, for otherwise there would have been no stability in the covenant! To this, Isaiah's reply is especially pertinent. For inasmuch as he saw that the unbelieving King Ahaz rejected his testimony concerning the lifting of the siege of Jerusalem and its immediate safety, he rather abruptly passes on to the Messiah: "Behold, a virgin shall conceive and bear a son" [Isaiah 7:14]. By this he indirectly indicates that although king and people wickedly rejected the promise offered them, as if they were purposely trying to discredit God's pledge, yet the covenant would not be invalidated, for the Redeemer would come at his appointed time. Here I am gathering a few passages of many because I merely want to remind my readers that the hope of all the godly has ever reposed in Christ alone. All the other prophets also agree. For example, in Hosea it is said: "And the children of Judah and the children of Israel shall be gathered together, and they shall appoint for themselves one head" [Hosea 1:11]. This he afterward explains more clearly: "The children of Israel shall return and seek Jehovah their God, and David their king" [Hosea 3:5]. Micah, also, referring to the people's return, clearly expresses it: "Their king will pass on before them, Jehovah at their head" [Micah 2:13]. So, too, Amos - meaning to foretell the renewal of the people - says: "In that day I will raise up the tent of David that is fallen, and repair its breaches, and raise up its ruins" [Amos 9:11]. This signifies: "I will raise up once more the royal glory in the family of David, the sole standard of salvation, now fulfilled in Christ." Hence, Zechariah, as his era was closer to the manifestation of Christ, more openly proclaims: "Rejoice, daughter of Zion! Be jubilant, daughter of Jerusalem! Lo, your king comes to you; righteous and unharmed is he" [Zechariah 9:9, cf. Comm.]. This agrees with the verse of the psalm already quoted: "Jehovah is... the saving power of his Christ. Save,... O Jehovah" [Psalm 28:8-9, cf. RV marg.]. Here salvation flows from the Head to the whole body. God willed that the Jews should be so instructed by these prophecies that they might turn their eyes directly to Christ in order to seek deliverance. Even though they had shamefully degenerated, they still could not efface the memory of that general principle: that, as had been promised to David, God would be through the hand of Christ the deliverer of the church; and that his freely given covenant, whereby God had adopted his elect, would stand fast. From this it came about that when Christ entered Jerusalem a little before his death this song was on the children's lips: "Hosanna to the son of David" [Matthew 21:9]. The hymn sung by the children apparently was commonly and widely known, and in accordance with the general notion that the sole pledge of God's mercy rested upon the coming of the Redeemer. For this reason Christ himself bade his disciples believe in him, that they might clearly and perfectly believe in God: "You believe in God; believe also in me" [John 14:1]. For even if, properly speaking, faith mounts up from Christ to the Father, yet he means this: although faith rests in God, it will gradually disappear unless he who retains it in perfect firmness intercedes as Mediator. Otherwise, God's majesty is too lofty to be attained by mortal men, who are like grubs crawling upon the earth. For this reason I subscribe to the common saying that God is the object of faith, yet it requires qualification. For Christ is not without reason called "the image of the invisible God" [Colossians 1:15]. This title warns us that, unless God confronts us in Christ, we cannot come to know that we are saved. Among the Jews the scribes obscured with false glosses what the prophets had taught concerning the Redeemer. Yet in spite of this, Christ took to be commonly known, as if received by general agreement, that there is no other remedy for a hopeless condition, no other way of freeing the church, than the appearance of the Mediator. Indeed, Paul's teaching was not commonly known - as it ought to have been - that "Christ is the end of the law" [Romans 10:4]. Yet this is true and certain, as is perfectly clear from the Law itself and the Prophets. I am not yet discussing faith because there will be a more suitable place for it elsewhere. Only let the readers agree on this point: let the first step toward godliness be to recognize that God is our Father to watch over us, govern and nourish us, until he gather us unto the eternal inheritance of his Kingdom. Hence, what we have recently said becomes clear, that apart from Christ the saving knowledge of God does not stand. From the beginning of the world he had consequently been set before all the elect that they should look unto him and put their trust in him. In this sense Irenaeus writes that the Father, himself infinite, becomes finite in the Son, for he has accommodated himself to our little measure lest our minds be overwhelmed by the immensity of his glory. Fanatics, not reflecting upon this, twist a useful statement into an impious fantasy, as if there were in Christ only a portion of divinity, outflowing from the whole perfection of God. Actually, it means nothing else than that God is comprehended in Christ alone. John's saying has always been true: "He that does not have the Son does not have the Father" [1 John 2:23 p.]. For even if many men once boasted that they worshiped the Supreme Majesty, the Maker of heaven and earth, yet because they had no Mediator it was not possible for them truly to taste God's mercy, and thus be persuaded that he was their Father. Accordingly, because they did not hold Christ as their Head, they possessed only a fleeting knowledge of God. From this it also came about that they at last lapsed into crass and foul superstitions and betrayed their own ignorance. So today the Turks, although they proclaim at the top of their lungs that the Creator of heaven and earth is God, still, while repudiating Christ, substitute an idol in place of the true God.